QtSphere IDE is an alternative Sphere development environment, focused on being both powerful and cross-platformy, for those of us who use Linux/Mac/*BSD/Solaris (or hypothetically any OS that Qt supports) and their respective miniSphere builds but lack a proper IDE without using the 1.x editor via WINE. It used to have a source code editor with syntax highlighting and line numbering, but because of difficulty with QScintilla, I'm going to focus on miniSphere's specific formats (Spritesets, maps, etc) and leave code editing to my Visual Studio Code extension. You can still open plain text files if you want, but there are better alternatives. Ooooh, this looks interesting. To make it manageable, though, maybe just focus on one element of Sphere things. I wouldn't mind there being a set of tools rather than just a whole IDE, at least at first. Also, with the ongoing discussion about leveraging cross-platform map editors like Tiled, it might be good to discuss that and figure out how to proceed! I think it would be easier to have a group of tools in one program, rather than multiple programs. 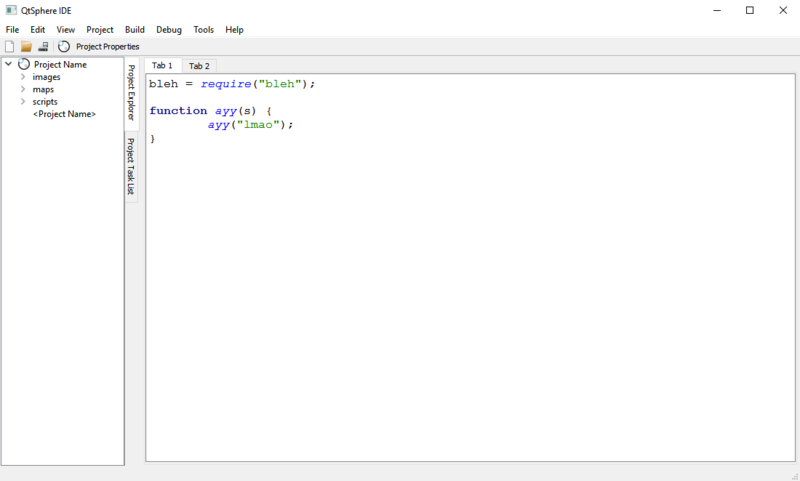 And with Qt Creator, it doesn't seem to be too difficult, lack of serious C++ experience aside. If you wanted to write the backend in Java instead of C++, you could use the Qt Jambi library in Java to make use of all the Qt stuff. I did consider that, but I don't want to have Java as a dependency. 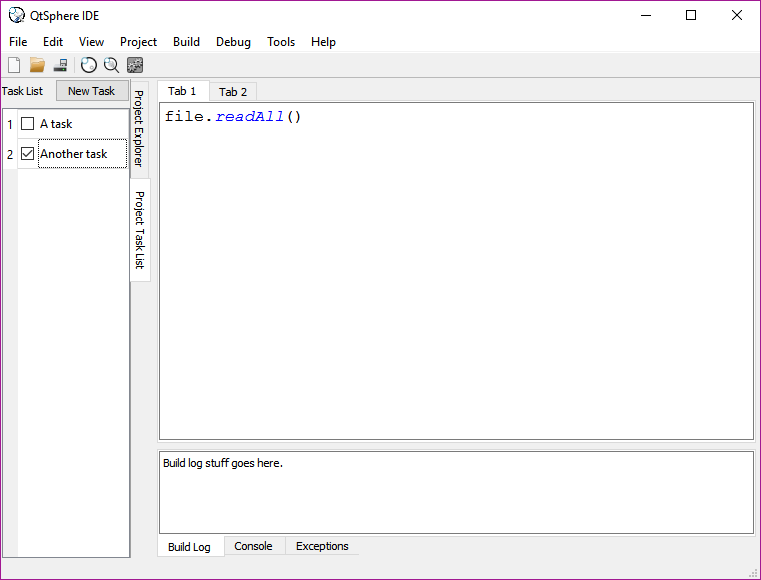 It actually looks (a little bit) like an IDE now! One great feature for the IDE to eventually have would be Cell integration, in other words have the IDE compose the Cellscript for you automatically from the project metadata, so you don't have to write one. 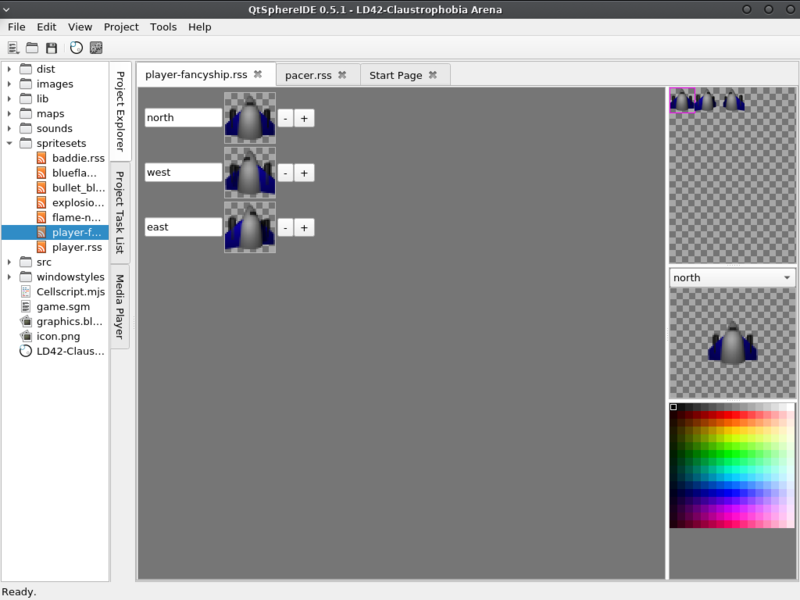 This is something I'd really like to implement in Sphere Studio now that minisphere is more established as The One True Sphere Engine(tm) but it requires pretty tight integration with the project system which I'm not sure is possible to do within the confines of the current plugin architecture. As much as I love plugins, I don't think QSI is going to have much of a plugin system. So everything that wouldn't normally be handled by minisphere anyway is going to be built in, including debugging. With plans to port minisphere to mobile platforms, I'd like QSI to be able to eventually communicate with minisphere over USB though I have no idea how that would work, so I'm not in a hurry to implement it. It's barely off the ground and can't even save/load yet. I use both Windows and Linux, so that won't be an issue. Do you use macOS, or are you familiar with mobile app development? Note that Cell and SSJ are meant to be first-class parts of the Sphere v2 toolchain. So if QSI could integrate directly with SSJ that would save a lot of duplicated effort. That would need a bit of reworking on my part to standardize the SSJ output and make it easier for outside programs to parse. By "handled by minisphere" I was referring to SSJ and Cell as well, with QSI integrating with them directly rather than using a plugin for that. Now with more buttons, a window/exe icon (Windows only, though some Linux window managers will show it) and some logging tabs! Well TIL (ok, yesterday but no1curr) how debugging works. Qt Creator makes it surprisingly easy regardless of your OS.